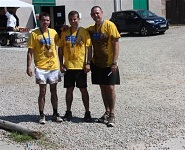 An intrepid trio from John Lawrie Group’s Montrose operation have raised over £750 for Marie Curie Cancer Care by participating in the charity’s Whole Hog Challenge at Crathes Castle on Sunday, 27 May 2012. Team members Craig Jessop, Paul Smith and Keith McLaren, combined a 12km run with an adventure assault course in some of the warmest temperatures that north-east Scotland has had this year. Participants had to contend with challenges such as climbing over hay bales and farm gates and crossing rivers and ditches, as well as covering the 12km distance. Fortunately all three of the team from the environmental services and metal reprocessing company, who competed under the team name ‘Men of Steel’, were up for the physical challenge. The trio are now keen to repeat the challenge next year and are also considering entering increasingly demanding events.